Begin With Surya is a grandiose and much more fusion-ised reworking of the theme composer Balabhaskar created a few years back for the Soorya Music and Dance Festival held every year in Trivandrum. And the man who totally owns the show, despite featuring Sivamani on the percussion (who is awesome as usual btw), is Balabhaskar himself. Peppered with flourishes reminding one of L Sub, he leads the song to finish on a mindblowingly high energy note. A video has also been released for the song, invoking the five elements. While I didn’t find the video any special, the song will make you forget all that. Next up is the cheesily named Lover Boy which sees Bala fuse carnatic with pop elements. The song has interesting points, like the bass loop (which seems to be Hindolam) and some improvs on the violin. But there are negatives too. The vocals by the composer did not work for me. Overall, just about listenable track. Which gives way to Barter Bank where Bala jams with his Matrixx bandmates Louiz Banks, Gino Banks and Sheldon D’Silva. Between the starting and ending sections where all the artistes play together, the track has clearly demarcated parts for the solos of the two lead players, Bala easing through some 5-6 ragas in the first three minute long segment, followed by a jazz portion by the senior Banks, apart from a short jugalbandi of sorts between the bassist D’Silva and drummer Gino. 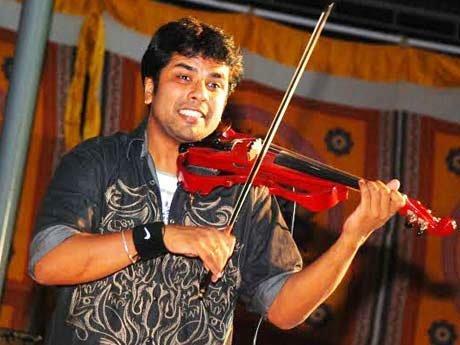 If you love jazz carnatic fusion you will like this. Wonder if this has already appeared in Matrixx’s repertoire though. The composer next tries fusion with rock in 10 Counts To Bliss, an experiment which yields very good results, even the Sanskrit vocals working well. Apart from the violin which alternates between carnatic and western, the orchestral arrangement has been done well. Grammar Bewitched has tabla exponent Fazal Qureshi at work and that is one of the very few things that are good about the song. The vocals spouting out nonsensical lyrics fail to appeal at all. The electric violin sounds quite like a guitar in many places. One of the less attractive songs in the album. Being In Dark which follows is remarkably better, though the composer could have cut down on the vocals and done more of that beautifully done instrumental piece which occupies less than half the song. The album ends with a song pretty much like the opener, B Yond, Balabhaskar nailing it with some fantabulous violin playing. In his debut fusion album Balabhaskar tries to incorporate quite a few genres. Some work, some not quite. Nevertheless, a commendable debut from the composer, that leaves one in no doubt about his violin skills. PS: Below are a couple of official videos of the album. Balabhaskar is really a blessed performer.